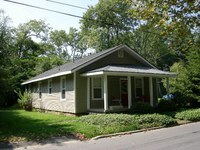 One-story front gable cottage with German siding. Attached front porch with hip roof, replacement posts, no balustrade. Brick foundation, six-over-one windows, brick foundation. Raymond and Alma Howard lived here from 1937 to 1938. Arnold Nelson, a driver with Blue Bird Taxi, and wife Geraldine lived here from 1939 to 1940. From 1941 to at least 1953 W. Clyde Whitlock, a salesman with Coca-Cola Bottling Company, and wife Margie lived in the house. Modern one-story, small frame storage building.